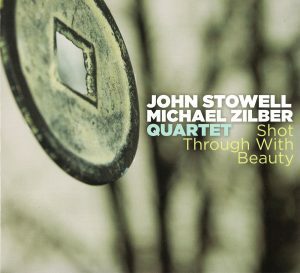 Talking about the newest release from the Stowell-Zilber collaboration, it starts with “Michael Zilber and John Stowell might be making their best music yet”, and goes on from there. 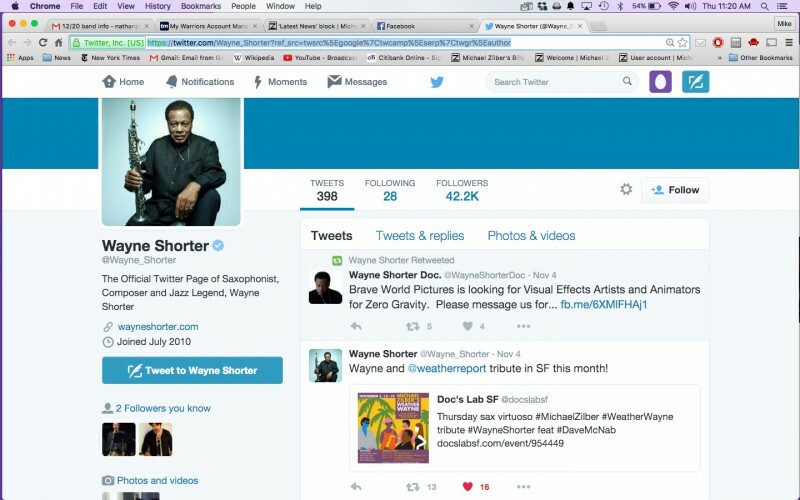 Wayne Shorter tweeted about my Weather Wayne band! In music as in romance, opposites often attract. East Bay saxophonist Michael Zilber is an extroverted burner who has forged a bracing post-Coltrane vocabulary. Guitarist John Stowell, long based in Portland, Ore., possesses a cool, crystalline tone and a knack for quietly astonishing harmonic flights. Over the past few years, they’ve honed a fire and ice partnership with the South Bay’s rhythm section tandem of bassist John Shifflett and drummer Jason Lewis. The quartet, which released last year’s aptly named CD “Shot Through With Beauty” (Origin), plays a series of gigs around the region over the next two weeks, including a Sunday afternoon house concert at Chez Hanny in San Francisco, the Hilton San Jose’s Affinity Restaurant as part of San Jose Jazz’s free Wednesday concert series, March 3 at the Jazzschool in Berkeley, and March 4 at Studio Pink House in Saratoga. 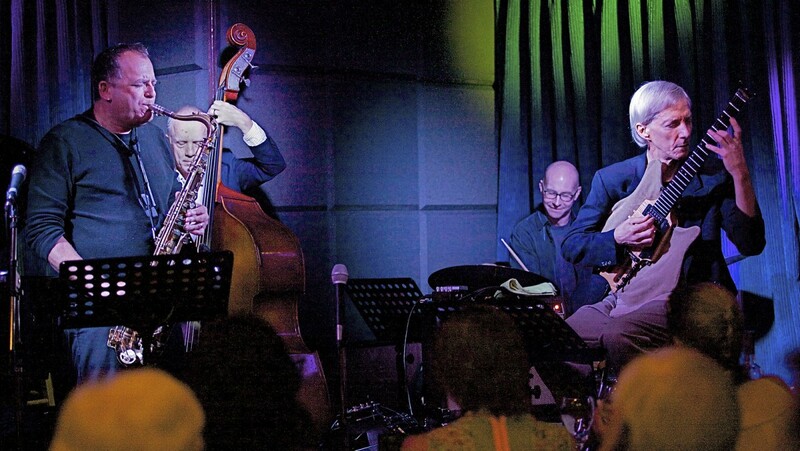 Long aware of each other’s work, Zilber and Stowell first met and heard each other play at the 2005 San Jose Jazz Festival, where the guitarist’s duo with bassist David Friesen preceded a set by a quartet Zilber co-led with pianist Susan Muscarella. Struck by Stowell’s singular sound, Zilber immediately decided to arrange some private playing time with Stowell. Part of what gives the quartet such a distinctive identity is a consistently enthralling repertoire. All four musicians contribute original pieces, but they also draw widely from gifted but little covered composers like trumpeter Kenny Wheeler, guitarist John Scofield, pianist Keith Jarrett and guitarist John Abercrombie. Even when they tackle a standard, such as Dizzy Gillespie’s “Con Alma,” it’s reharmonized so as to take on a new identity. Stowell gets most of the credit for bringing in the rarely played gems. After years of tackling the same standards at jam sessions, he started collecting interesting pieces. He’s gleaned hundreds of tunes over the years, and makes a point of pushing players and audiences to think beyond the usual suspects. Musical temperament isn’t the only thing that makes Stowell and Zilber a study in contrasts. The Connecticut-raised guitarist moved to Portland in 1976 to pursue a musical partnership with Friesen, a bassist already established as a creative force. When they started going their separate ways after seven years touring and recording together, Stowell relied on an international web of friends, and he’s become the quintessential itinerant musician who augments gigs with workshops and master classes. It’s not that Zilber never gets out on the road, but he’s pursued an alternative career strategy, making himself an essential component of the Bay Area scene. Born and raised in Vancouver, B.C., he moved to Boston to study at New England Conservatory and Tufts and went on to earn a doctorate in composition from New York University. After almost a decade in New York City, he and his wife (the late theater artist Carla Zilbersmith) decided to relocate to the Bay Area in the early ’90s when Los Medanos College in the East Bay offered him a job. As the head of the school’s jazz studies program, he’s mentored some of the region’s finest young improvisers, such as guitarist Terrence Brewer. Zilber leads a regular jam session at the Jazzschool, where he also teaches an advanced workshop for high school students. Despite his academic responsibilities, he manages to keep evolving as an artist. Though he’s always chosen to work with pianists rather than guitarists, he’s found an ideal foil in Stowell. Also: 8 p.m. March 3, Jazzschool, 2087 Addison St., Berkeley, $12-$15, 510-845-5373, www.jazzschool.com. 4 p.m. March 4, Studio Pink House, 14577 Big Basin Way, Saratoga; suggested donation $10-$20; www.studio-pinkhouse.com. Fans of John Scofield’s ’90s recordings should find much to enjoy on Shot Through With Beauty, and not merely because the album features a new quartet led by guitarist John Stowell and saxophonist Michael Zilber personalizing two sharply contrasting Scofield compositions, “Wabash III” and “The Beatles.” The former tune boasts an arrangement with twisting harmonized lines, guitar and sax solos that shrewdly bridge R&B swagger and postbop dissonance, as well as a rhythmically lopsided funk spin—courtesy of bassist John Shifflett and drummer Jason Lewis—that won’t quit. “The Beatles,” on the other hand, is comparatively subdued: sleek, insinuating and atmospheric, at least until Zilber’s impassioned soprano turns up the heat. When the band tackles tunes by Kenny Wheeler (“Kayak,” with Zilber on tenor sax) or Dizzy Gillepsie (“Con Alma,” as spacious as it is soulful), it’s not hard to imagine Scofield himself admiring the fresh perspectives and intuitive interplay that develop. Stowell’s bandmates also keep a series of worthy compositions coming. In addition to penning the album’s title track, a ballad that lives up to its billing, Zilber contributes three tunes that are always enjoyable and quite often intriguing. (“Tender,” the album’s unaccompanied tenor coda, is one such track.) Shifflett’s coiled “Quantum Theory” and Lewis’ resonating portrait “In the Park” inspire similarly colorful interludes. Stowell doesn’t add to the playlist, but there’s no mistaking his remarkable prowess and sensitivity on electric and acoustic guitars—or the fun he’s having in this highly interactive setting.